Since the invention of the internet, we have been at the forefront of website design and development. We created our first website (our own) back in December 1999 and have since built websites for numerous individuals, businesses (from start-ups to famous brands) and organisations (charities, public sector, private sector). So whatever your website design requirement we can help. Here is an example of a three page HTML website (the kind often chosen by start-up businesses as their first website, for its simplicity and low cost). It gets the businesses message across and gives more detail than a simple holding page. 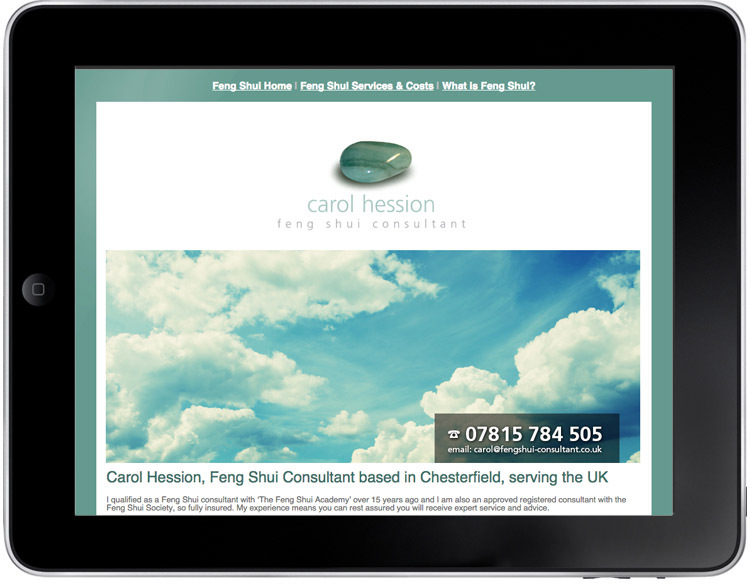 Initially we were commissioned by Derbyshire Feng Shui Consultant, Carol Hession to create her logo, some business cards and a promotional leaflet. 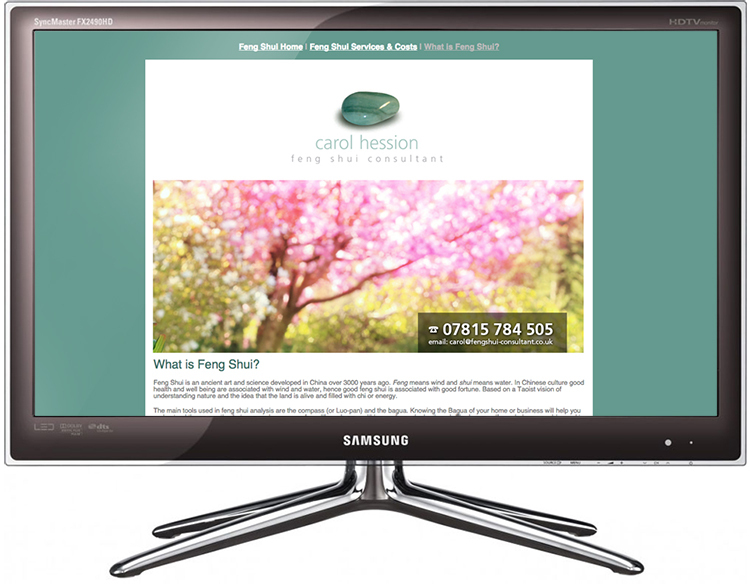 As her business appears on numerous directory websites (both commercial and for various Feng Shui bodies), she realised that she could link these to her website, increasing her chances of picking up new business, and by looking much more professional than her competition. If you have a new business or new a website for your organisation get in touch with the Derbyshire website design experts, based in the Peak District village of Eyam, Hope Valley (conveniently located near Manchester, Chesterfield, Derby, Sheffield, Nottingham, Matlock and Buxton). Your locality really doesnt matter, we do website design for companies throughout the UK and even abroad (as far a field as Bali in Indonesia!). Call us for a FREE quote and to discuss your website design requirements on 01433 208 307.